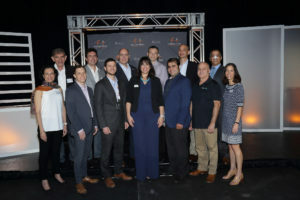 On June 13th, the Florida-Israel Business Accelerator welcomed the Tampa Bay community to the Bryan Glazer Family JCC for its annual event, Innovation Fusion: A Collaborative Exchange. 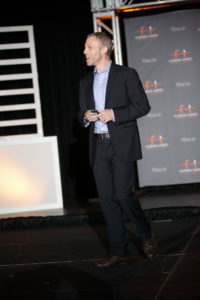 The event drew nearly 500 guests, which is a 40% increase from last year. The record-breaking attendance was no surprise, as keynote presentations included top executives from Waze, a Google company, and Wix, a cloud-based web development platform. 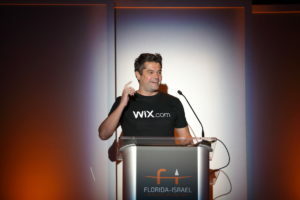 First of the two keynote speakers to grace the Innovation Fusion stage was Wix’s Danny Brigido. Danny was relocated to Miami, FL a year and a half ago to manage their Miami office. In that time it has grown from 36 people to over 120. Brigido explained this has a whole lot to do with company culture and keeping employees happy. Yes, lunchtime beach sessions and hanging out passed “office hours” are all encouraged at the Wix dwellings. In between guest speakers, engaging panel discussions, presentations, and demonstrations from each of the 8 companies in FIBA’s 2018 cohort took place. 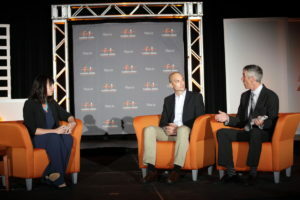 In the discussion portion, FIBA brought in local subject matter experts that allowed for a dynamic conversation with the company representatives about how their technologies meet real needs and trends. FIBA cohort member and ECOncrete co-founder and CTO, Ido Sella, was paired with director of environmental affiars at Port Tampa Bay, Chris Cooley, to discuss how ECOncrete’s solutions could help to maintain our local marine life eco-system. UC-Care’s VP of business development and marketing, Tomer Schatzberger, talked about the current state of prostate cancer diagnostics with Suncoast Urology’s Dr. Arnie Tannenbaum. President of GlobeKeeper sat down with veteran Captain of the Tampa Police Department , David Goodman, to have a conversation about the importance of streamlined commincation in the event of emergencies. “Brick and mortar is not dead!” was the key takeaway from WiseShelf CEO, Shalom Nakdimon, and retail industry expert, Eric Williams, of E2 Innovation Group. Presentations from others in the cohort such as Nucleon, Intervyo, and Say, wowed the audience with their innovative technology solutions. In addition, dignitaries like Senator Dana Young, Representative Jackie Toledo, County Commissioner Sandy Murman, and Deputy Consul General of Israel to Florida, Mississippi, Alabama and Puerto Rico, Guy Gilady, made their remarks. With a lineup like this, the excitement was palpable. And what all event-goers could take away from the morning is that Tampa continues to be a prime market for entrepreneurial growth. The event was made possible by presenting sponsor Valley National Bank; premier sponsors, Cherry Bekaert, ConnectWise, and Nielsen; community sponsors, BB&T, Helene & Leonard Marks, RedRock Leadership, Sue & Jeff Shoenbaum, and TriNet, and community sponsors, Akerman, Metzler Advisory, Phyllis & Gary Gould, Synovus and Sykes.